Oxiclean is a high energy stain remover that uses the power of oxygen to clean and deodorize. It cleans and whitens like bleach, but is completely safe for colors and whites-tough on stains, but gentle on your fabrics. Oxiclean comes in concentrated crystal form and mixes with water to release its cleaning strength. After eliminating stains, oxiclean breaks down into harmless water, oxygen and soda ash and has NO ODOR-it is completely biodegradable and safe for use around your children, pets and in confined or poorly ventilated areas. With your help we can reach more people and let them know about Oxi Clean whether this product works or not. Initially, Oxi was working pretty well on my clothes. For the most part, the stains were coming out, and my whites were whiter then when I was using bleach. But, I'd say after about one month of usage, I noticed holes in my clothing. So in the long run, this wasn't the product for us. Oxi clean wont be a miracle cleaner on EVERYTHING, but for those things with organic based stains it is wonderful. I had a delicate mesh dress with drink stains on them and just by soaking they came up with no scrubbing. Works best with very hot water. Oxi Clean is a rare item; a TV product that actually works. 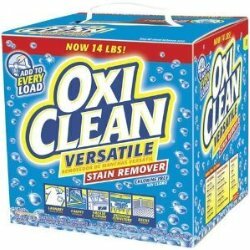 Now, oxygenated bleaches are nothing new in concept, and for jobs that chlorine won't hurt, don't seem to work any better than regular bleach, BUT I find Oxi Clean does the job as advertised, is gentler than chlorine, and especially good at 'floating' dirt up off of items with little or no agitation.